Tuscan extra virgin olive oil is one of the most widely appreciated Italian products in the world for its excellent quality and extraordinary properties. With just a click you can now order cold pressed extra virgin olive oil online and have the precious, authentic taste of freshly-picked olives delivered directly to your home. Besides the fact that it is produced in this area of the Mediterranean, Tuscan olive oil is also made special by the way in which the olives are processed. After picking, the fruit is selected and leaves are removed to avoid giving the oil a bitter taste. After this, two fundamental stages take place: the milling or pressing of the olives using stone presses, and the process of de-emulsifying the oil from the water and oil emulsion. Both processes are carried out at a temperature of below 27° C, hence the term ‘cold pressing’, so that the properties of the olives remain unaltered and the oil obtained has a low level of acidity. Real Tuscan extra virgin olive oil is made from virgin olives picked in Tuscany, has obtained a panel test of 6.5 or above, and an acidity of less than 0.80 g per 100 grams. 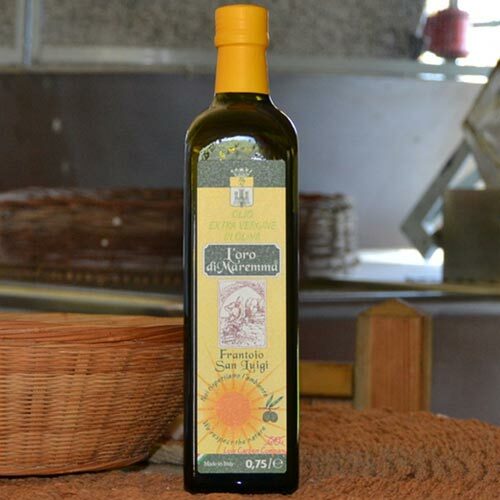 The fresh pressed olive oil produced by the Frantoio Zanaboni of Massa Marittima (Grosseto Province), available to buy online from our website shop (in 0.75l bottles and 1l or 5l cans), is unfiltered cold pressed extra virgin olive oil, obtained from mechanical stone pressing. Its acidity rarely exceeds 0.50g. Authentic Tuscan extra virgin olive oil, recommended by and supplied to Vivere la Toscana by Enoteca la Bacchino.